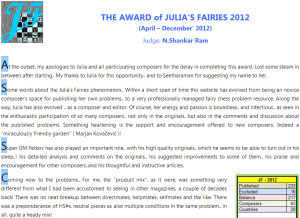 The Preliminary Award of JULIA’S FAIRIES 2012! You know, there were about 200 problems for period April – December’2012. So many very good problems, so many famous authors, so many interesting comments, versions!.. Judging of this tournament was a real challenge! And I’m very thankful to N.Shankar Ram for accepting my invitation and for his hard work! Please send your comments, correction and objections to the Award until 15th of December, 2013, when the Award becomes Final. Final Award will have also PDF version to download/print. Congratulations to the winners! It was a delight to go throgh the award and appreciate again all those delightful problems. Julia and the participating composers/commentators have raised the standard of this website to such a high level that I think some of the lower placed problems would have been prize winners in some other tourneys! Thanks to Shankarram for completing this tough judging task within a year. Happy to see C.G.S.Narayanan getting commended for his beautiful Superguards problem! I hope this is the first of many superguards problems winning places in regular tourneys in future !